Best Available School Scheme admission notification 2018: AP Best Available Schools(BAS) Admissions Online Application form 2018-19/ AP Best Available school scheme Admissions, AP BASS Admissions:: Best Available School Scheme Admissions notification 2018, Best Available School Scheme Selection notification 2018, #BASS admission test/entrance test not conducted for this year: Tribal Welfare Department/Social Welfare Department would give the BASS Admissions 2018 notification in every year in March/April month for admission into 3rd, 5th, 8th classes for the academic year 2018-2019 and invites applications from the eligible students for admission into 3rd, 5th, 8th classes under #BASS. Collector Yogitarana said in a statement that applications for admission under the Best Availability Schools Day Scheme for the academic year 2018-2019 will be applicable to the SC students of Hyderabad district. Public, missionary schools, residential or other schools that offer discipline, quality education can apply this scheme . The State Board of Management and the CBSE can apply to the Managing Committee with the recognition of ICC. 90% pass in five years and a 50% pass in the first round. For details, Exhibition Grounds, SC Development Project in the Manoranjan Complex Block - 3 will consult the SCD's office. On May 10, Tribal Welfare Department Mahabubabad District has given the BASS (Best Available School Scheme) Admissions 2018 notification for admission into 3rd, 5th, 8th classes for the academic year 2018-2019 and TWD Officials invite the application forms from the eligible students for admission into 3rd, 5th, 8th classes under BASS from 10th May 2018 to 25th May 2018. 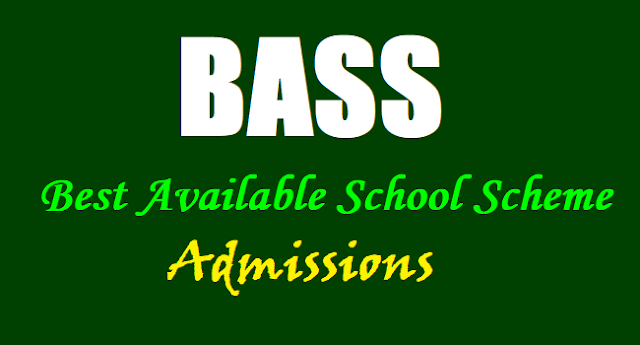 On May 09, Tribal Welfare Department Warangal Urban District has given the BASS (Best Available School Scheme) Admissions 2018 notification for admission into 3rd, 5th, 8th classes for the academic year 2018-2019 and TWD Officials invite the application forms from the eligible students for admission into 3rd, 5th, 8th classes under BASS from 10th May 2018 to 25th May 2018. On May 09, Tribal Welfare Department Khammam District has given the BASS (Best Available School Scheme) Admissions 2018 notification for admission into 3rd, 5th, 8th classes for the academic year 2018-2019 and TWD Officials invite the application forms from the eligible students for admission into 3rd, 5th, 8th classes under BASS from 10th May 2018 to 20th May 2018. బెస్ట్ అవెలబుల్ స్కీమ్ కింద ప్రముఖ విద్యాసంస్థల్లో ప్రవేశాల కోసం అర్హులైన ఎస్సీ విద్యార్థుల నుంచి దరఖాస్తులు ఆహ్వానిస్తున్నామని జిల్లా కలెక్టర్ డా. యోగితారాణా ఒక ప్రకటనలో తెలిపారు. 2018- 19 విద్యా సంవత్సరానికి గాను నాన్ రెసిడెన్షియల్ కోటాలో 1వ తరగతిలో ప్రవేశాలకు అవకాశం కల్పిస్తున్నామని పేర్కొన్నారు. వార్షికాదాయం రూ. 2 లక్షలకు మించని, హైదరాబాద్ జిల్లా వాస్తవ్యులై ఉండి, 01-06- 2012 - 31-05-2013 మధ్యకాలంలో జన్మించిన వారు మాత్రమే అర్హులని వెల్లడించారు. జిల్లాలో 90 సీట్లు కలవని, 90కి మించి దరఖాస్తులు వస్తే లక్కీ డ్రా నిర్వహించి ఎంపిక ప్రకియను చేపడతామని వెల్లడించారు. దరఖాస్తు చేసిన విద్యార్థితో పాటు తల్లిదండ్రులు లక్కీ డ్రా నిర్వహించే సమయంలో అందుబాటులో ఉండాలని సూచించారు. ఒక కుటుంబం నుంచి ఒక విద్యార్థికి మాత్రమే ప్రవేశం కల్పిస్తామని తెలిపారు. On May 21, Tribal Welfare Department Hyderabad District has given the BASS (Best Available School Scheme) Admissions 2018 notification for admission into 3rd(15 seats), 5th(8 seats), 8th(7seats) classes for the academic year 2018-2019 and TWD Officials invite the application forms from the eligible students for admission into 3rd, 5th, 8th classes under BASS from ....May 2018 to ..... May 2018. On May 21, Tribal Welfare Department Mancherial has given the BASS (Best Available School Scheme) Admissions 2018 notification for admission into 3rd(15 seats), 5th(8 seats), 8th(7seats) classes for the academic year 2018-2019 and TWD Officials invite the application forms from the eligible students for admission into 3rd, 5th, 8th classes under BASS from ....May 2018 to .....May 2018. On May 21, Tribal Welfare Department Nrimal/Utnur has given the BASS (Best Available School Scheme) Admissions 2018 notification for admission into 3rd(seats), 5th( seats), 8th(seats) classes for the academic year 2018-2019 and TWD Officials invite the application forms from the eligible students for admission into 3rd, 5th, 8th classes under BASS from ....May 2018 to .... May 2018. On May 30, Tribal Welfare Department Seethampet has given the BASS (Best Available School Scheme) Admissions 2018 notification for admission into 3rd(19 Boys+10 Girls=29 seats), 5th(9 Boys + 5 Girls= 14 seats), 8th(9 Boys + 5 Girls= 14 seats) classes for the academic year 2018-2019 and TWD Officials invite the application forms from the eligible students for admission into 3rd, 5th, 8th classes under BASS from .....May 2018 to ...... June 2018. Admissions to Scheduled Castes for Admission into Best Availability (Day Scholar) Schools in 2018-18 are being invited by the Scheduled Castes Development Officer of Medchal district Officer Salmaraju. The parents of children within the age of five to six years should apply for admission in the 1st class. Parents' annual income should be below Rs 65,000 for rural areas and Rs 75,000 for urban areas. From July 1st, the applications to be get from the collectorate. The completed applications are to be submitted on or before July ......, 2018 by 3.00 PM. On July ...., Selection would be done. The selected students are to be admitted in RSK High School, Chintal Bapunagar(EM-Coeducation), Kushayee guda and Kukatpally Brilliant Grammar Schools. SC Welfare Department /Telangana Tribal Welfare Department has given permission to selection of ST students for Best Available School Scheme for 2018-2019 and TSW/TTW Department has sanctioned total 148 seats i.e., 74 seats for 3rd class, 37 seats for 5th class and 37 seats for 8th class and these seats would be filled up through draw of lots. Selection Procedure: Draw of lots. How to apply: students should obtain the application forms from the following offices with free of cost and should submit the applications along with following required documents attested with Gazetted officer on or before as per announced date to the Concerned officials/SW/ITDA Offices in Concerned District. 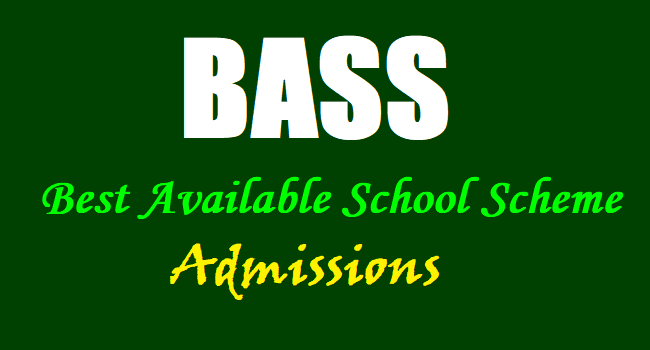 Educational Institutions may apply to the concerned District Officials on or before "See above mentioned date" for BASS Admission..